QUEENSLAND Premier Anastacia Palaszczuk has described seeing a ‘sea of dead cattle’ during an aerial and ground inspection of flood-ravaged northwest Queensland yesterday. The natural disaster that is unfolding across the region (see Wednesday’s original report) continues to worsen, with Federal Government ministers and prime minister Scott Morrison meeting today to discuss emergency relief measures for the flood-affected area. The government has already announced an extra $3 million in mental health services would be provided to enable a surge response team to help people in northern and western Queensland. 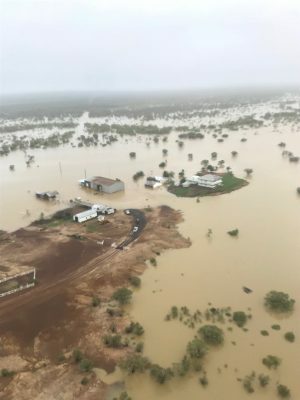 A huge swathe of pastoral land stretching from Hughenden in the east to Cloncurry in the west – a distance of more than 400km – is largely under water after falls of 600mm or more fell across the region in the past fortnight. Low-lying areas are in places under three metres of water, and major river systems like the Flinders stretch from horizon to horizon from the air. The worst affected area also extends south towards McKinlay and Kynuna, and north into the lower Gulf region. One producer with large cattle grazing interests in the Julia Creek area suggested up to one million cattle may be located within the worst-affected zone. “It’s flooding of biblical proportions,” he said. “It’s exceeded all previous known flood levels – some records going back 100 years or more. Some properties have exactly zero land above water,” he said. Cattle already weakened by severe drought conditions have died, or are dying, in alarming numbers, either through exposure after weeks of solid rain followed by cold winds, lack of access feed, bogging in quagmire conditions on isolated high spots or simply being swept away in the floodwaters. Julia Creek cattle producers Jake and Sally Webster provide a graphic account of the situation on their family property Balootha, on the Flinders River in today’s separate report. A fleet of helicopters have been performing emergency fodder drops out of centres like Richmond and Julia Creek, and emergency hay supplies have arrived today in Longreach. One producer described a ‘hopeless situation’ to Beef Central on Wednesday, where desperately hungry cattle receiving fodder drops from the air on patches of high ground were churning the pads near the hay so badly that they were bogging themselves and perishing. Further north in the lower gulf, slow-moving water is still rising along the Flinders and Saxby Rivers. Some pastoral company-owned properties in the region are understood to face an additional challenge, having earlier received uplifts of additional cattle from desperately dry company properties further west towards the Barkly Tableland. A spokesman for the Australian Agricultural Co would not speculate on likely losses on company properties like Canobie and Wondoola. “We know there’s been a significant flood event, but anything beyond that is still speculation at this stage,” the spokesman said. Estimates of overall stock losses in the region have grown dramatically in the past two days, but the truth is it may be months before any accurate assessment is made. One contact suggested it may not be until the completion of first-round musters in April or May (perhaps later, given what’s happened this week) before any sort of accurate assessment is made of remaining stock numbers. What can be said is that losses on some individual grazing properties across the region have been extreme. Calf losses alone, will have a dramatic impact on future herd recovery. Some local estimates this morning now put likely losses at least 100,000 head, and conceivably as high as 250,000 head. To put this into some context, Federal member for Kennedy Bob Katter claimed flooding from Cyclone Ted in 1976 claimed about 150,000 cattle. “We have all seen the images, the devastating scenes of what’s occurring in north Queensland and this is a very significant flood event,” he said. AgForce Queensland chief executive Michael Guerin said the situation was of catastrophic proportions. Truckloads of hay started arriving in Longreach on Friday, with about 1500 bales expected to be delivered to towns in western Queensland. Queensland premier Annastacia Palaszczuk saw first-hand the devastation in the state’s northwest yesterday, noting dead cattle lining paddocks on the Cloncurry to Normanton Road. She announced flood-affected farmers would be able to apply for grants of up to $25,000 through a disaster recovery fund. While the region is currently focussed entirely on managing the devastating flood impact, already thoughts are being given to the longer-term positive impact that lies ahead in terms of pasture growth. Agents in Winton and Richmond have reported immediate inquiry from producers further south who are still in severe drought, seeking to either secure agistment or sell cattle once feed starts to return in areas impacted by rainfall further north. With floodwaters barely starting to subside one agent said he had fielded 30 calls already from people seeking to place cattle on agistment, once paddocks start to dry out. Sub-soil moisture would now guarantee a body of feed for at least 12 months across large parts of inland North Queensland, Richmond stock agent Luke Westaway said. “But there’s a huge recovery process that has to unfold first,” he said. Grants of up to $25000 are a drop in the bucket in this disastrous situation and I feel this needs to be increased to actually equate to the enormity of the disaster. These farmers have already faced so much with continuous drought and now another natural disaster is upon them. The government needs to treat and respond to the disaster as the huge disaster it is when is the aid actually going to equate financially on the scale that is needed? Funding for mental health is very important however, the government needs to realise that unless the farmers are also compensated financially and for the value of all stock lost and given real support in this area also, their emotional distress will remain. Don’t expect any help from the state Labor government ,the flood damage isn’t in a high vote area and with the hatred they have against regional and rural Queensland especially in the north there no chance.And to get anything intelligent out of our state agricultural minister without his minders will be impossible !